Our product range includes a wide range of fargo card printer cleaning kit. The Fargo 86177 Cleaning kit includes everything you need to clean the inside of your Fargo printer to keep it working optimally. Dust and other tiny debris can degrade your printed image quality and even damage your printhead or other critical parts of your printer. With routine cleanings, you can expect optimal image quality and a longer life for your Fargo card printer. Fargo 86177 cleaning kits include card roller cleaning cards, print head cleaning pens, cleaning pads for general cleaning of the inside of your printer. By keeping track with business innovations, we are affianced in offering an expansive gamut of Fargo Card Printer Cleaning Kit. We also provides training kit for card printers. The Fargo 89200 HDP Cleaning kit includes everything you need to clean the inside of your Fargo HDP5000 printer to keep it working optimally. Dust and other tiny debris can degrade your printed image quality and even damage your print head or other critical parts of your printer. With routine cleanings, you can expect optimal image quality and a longer life for your HDP5000 printer. 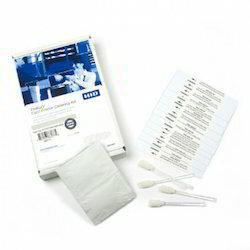 Fargo 89200 cleaning kits include print head cleaning swabs, cleaning pads for general cleaning of the inside of your printer, adhesive card roller cleaning cards and alcohol card roller cleaning cards. The HDP Cleaning Kit 89200 is for use with Fargo HDP5000 card printers. The Fargo HDP Cleaning Kit 88933 includes everything you need to clean the inside of your Fargo HDP8500 printer to keep it working optimally. Dust and other tiny debris can degrade your printed image quality and even damage your printhead or other critical parts of your printer. With routine cleanings, you can expect optimal image quality and a longer life for your Fargo card printer. Fargo 88933 cleaning kits include both adhesive and alcohol cleaning cards for cleaning the card rollers, cleaning swabs for cleaning the printhead, and cleaning pads for general cleaning of the inside of your printer. 88933 cleaning kits are for use with all Fargo HDP8500 printers. Looking for “Fargo Card Printer Cleaning Kit”?